Mumbai: ABG Shipyard Ltd, India’s biggest private shipbuilder, sold its 8.27% stake in Great Offshore Ltd to a clutch of investors on Wednesday, a day before its public offer for buying shares of Great Offshore opens, adding a new twist to a no-holds-barred corporate battle for India’s largest offshore oilfield services firm. Bharati Shipyard Ltd, its rival that owns 23.17% in Great Offshore, has meanwhile raised its open offer price for shares of Great Offshore from Rs560 to Rs590 a share. ABG Shipyard’s offer price is Rs520 a share. Both the offers open on Thursday. ABG Shipyard wants to buy a 33% stake in Great Offshore while Bharati Shipyard’s offer is for a 20% stake. 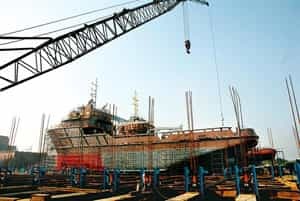 Even after selling its existing stake, ABG Shipyard may still technically remain in the fray since, if it withdraws the offer, it will have to forgo about Rs81 crore that is being kept in an escrow account. Under the takeover norms of India’s capital market regulator, any company making a bid for another company is required to keep a certain percentage of the total cost of its proposed acquisition in an escrow account before the offer opens and this money is forfeited if the offer is withdrawn. The shares of Great Offshore fell 5.89% on the Bombay Stock Exchange (BSE) on Wednesday to close at Rs512.95 apiece, below both the offer prices. Bharati Shipyard’s scrip rose by 10.59% to close at Rs177.60 and that of ABG Shipyard gained 9.43% to end the day at Rs206.50. Analysts said ABG Shipyard’s decision to sell its stake is part of treasury operations, having bought the shares at a cheaper price. Besides, it has made the deal more expensive for Bharati Shipyard with which it fiercely competes for shipbuilding and repairs. Following the transaction, ABG Shipyard’s holding in Great Offshore has come down to 571 shares, the company said in a note to BSE. No official of either ABG Shipyard or Bharati Shipyard was available for comment. “The whole thing looks fishy. What is the rationale for buying at such a high price while the market price is much lower? I am not comfortable with such transactions on the eve of the open offer," said Arun Kejriwal, director of Kejriwal Research and Investment Services, a stock advisory firm. Kejriwal owns shares in Great Offshore. Rashesh Shah, chairman of Edelweiss Securities Ltd, said such transactions are “arbitrage buying" and his firm does such deals regularly ahead of open offers. Bharati Shipyard has invested Rs322.32 crore in acquiring 23.17% in Great Offshore. At Rs590 a share, it will have to spend another Rs462 crore to buy a 20% stake in Great Offshore. The saga started in May when Bharati Shipyard paid Rs315 each for acquiring a 14.98% stake in Great Offshore after its promoter Vijay Sheth forfeited shares pledged with the company. On 4 June, Bharati made an open offer to buy from shareholders additional 20% stake at Rs344 a share. That brought ABG Shipyard in the fray and both the firms have raised their offer prices several times since then. “ABG Shipyard played a trading game and exited," said Kapil Yadav, a research analyst at Dolat Capital Market Pvt. Ltd. “But the deal has proved to be expensive for Bharati Shipyard because ABG entered the fray." “It was a great deal for ABG, as it exited the race by cashing out its stake," said Navindar M., an analyst with Natverlal and Sons Stockbrokers Pvt. Ltd. The acquisition of Great Offshore has become a compulsion rather than a choice for Bharati Shipyard, said another Mumbai-based analyst, who did not want to be named. Bharati is constructing one oil drilling rig and a support vessel for Great Offshore, together worth about $220 million (around Rs1,020 crore). “These two shipbuilding contracts could have been in trouble if ABG were to acquire Great Offshore," he added. Great Offshore’s assets and customers would provide a platform for a shipbuilder to derisk its main business of constructing ships as the global shipbuilding industry faces an uncertain future, after the current orders are executed, due to a slump in demand. Like its global peers, both ABG and Bharati face a big dearth of new orders. Buying Great Offshore would help either of them to quickly enter the lucrative business of supplying ships to the offshore oil industry, which otherwise would have taken them years, were they to go it alone. The entry rules for new companies venturing into the support vessel supply business are stringent, both in India and elsewhere. On BSE, the volume of trade of Great Offshore surged to 5.17 million shares on Wednesday against a daily average of 195,000 shares in the past week. Similarly, on the National Stock Exchange, the volume soared to 4.52 million against an average of 641,000 in the last fortnight.